Every day Bingo and I go for the same 2 mile hike on my lunch break. We start at the bottom of the mountain, climb the trail and end up in a huge, gorgeous field that leads up to the bluffs. 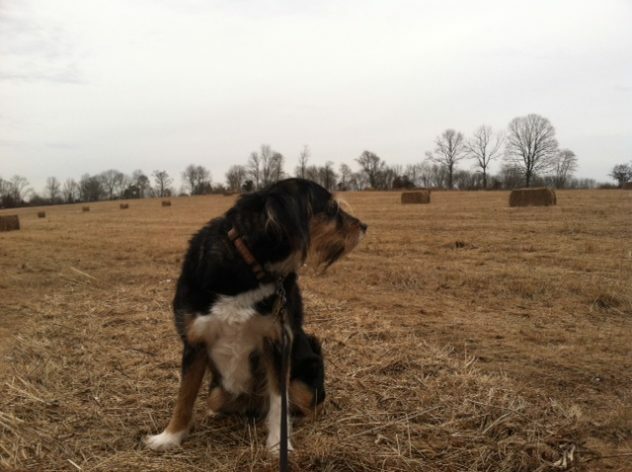 Bingo enjoys jumping up on the hay bales and getting a bird’s eye view. There are days when it seems so repetitive and at times even a little dull. When I start to feel that way, I just pay attention to Bingo. He is always so appreciative to be outside. He doesn’t care if it is the same hiking spot day after day, to him it is always exciting. There are always new smells to sniff and small changes that I don’t even notice. When I watch this excitement he has hike after hike, it brings me back and I have a renewed appreciation for the same old walk. I try to take note and apply this thinking to my every day life as often as possible.